Zen Studios wants all of their games on every platform possible, and who could blame them? After porting KickBeat over to the PlayStation 4, they have now brought last year’s CastleStorm to the current generation. Bundled with all previous DLC and extra goodies, is it enough to warrant a re-purchase for existing customers? At its core, the Definitive Edition is the same game. There’s the same light-hearted campaign, replete with jokes and setups aplenty. You still play as Sir Gareth, the Defender of the Realm, warding off the Vikings, whom you’ve had peace with for years thanks to a pair of magical gems that each kingdom has possessed. With the knights’ gem stolen, it is up to you to save the day. Two additional content packs, originally released as add-on DLC, is included here. The PS4 has helped with the game’s visual, noticeably. Character models look crisper, lighting is better, but most importantly the frame rate is rock solid. No matter the action or amount of destruction going on at any moment, the gameplay remains as smooth as butter. This most likely has to do with the PS4’s beefier hardware, but to play this smoothly while also looking better is a welcome development. It makes going back to the previous version kind of an eyesore (not quite, though, as the game does have a nice stylized artstyle to begin with). The soundtrack is intact, as arranged by Waterflame (of Castle Crashers, and, now, CastleStorm fame), with sweeping melodies and epic ballads. Exclusive to this Definitive Edition is the use of the DualShock 4’s speaker. Whereas normally a commentator would announce that your flag has been taken/recovered, or compliment you on a headshot through the television, he now speaks directly out of your controller. While playing this game, I had the volume of the speaker on quite high, as I’ve found that many games don’t produce very loud sounds out of it. CastleStorm is an exception – that announcer is loud. It’s nice touch and a reminder that you’re playing on the PS4. Essentially, this is the same game as before. If you’ve sold off your PS3 and want to play this game again, then it’s a complete package for $14.99. If, however, you are content with playing this on your older console or Vita, then it is kind of hard to recommend for this price. If there were a discount for existing customers, this would be an easier sell. With that exception aside, though, if you never picked up the game and want to play the ultimate version, then by all means plop down the cash! The game runs more smoothly, looks better, and even incorporates the DualShock 4 controller’s speaker to comical effect. 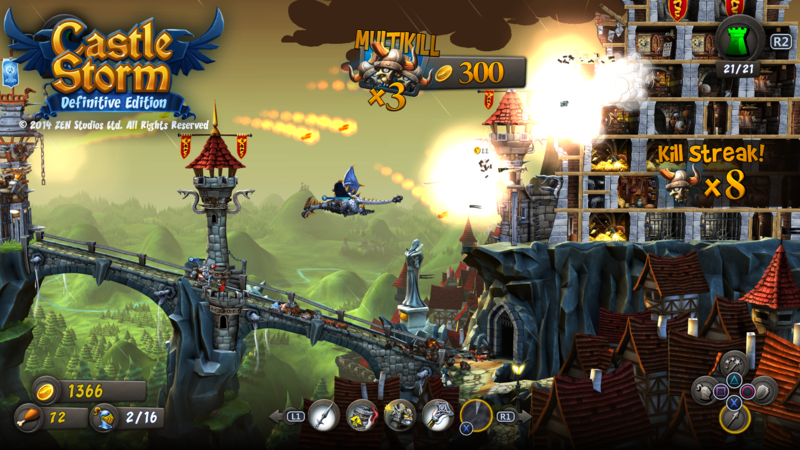 CastleStorm remains loads of fun and as challenging as you let it become. Just don’t forget to send some troops out there! Includes all DLC from previous-gen release. Can be tough to keep track of all you need to do.